The Cathedral of the Incarnation, built c. 1876 by John Kellum and Henry G. Harrison in Garden City for the Episcopal Diocese. 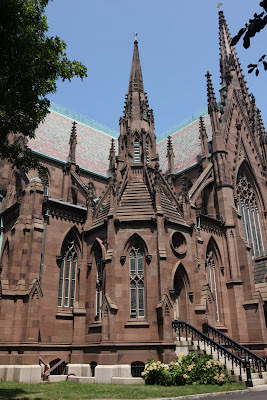 The cathedral was built as a memorial and mausoleum for Garden City's founder Alexander Turney Stewart. Click HERE to see the Cathedral of the Incarnation on google earth. Thanks for posting this! 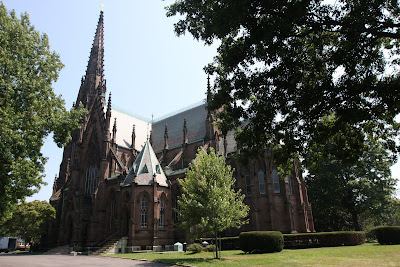 As a kid growing up on LI, my dad sang in the cathedral choir. I lived in GC (Steward Manor) after college and always loved driving by the cathedral. I haven't been on the Island for over a decade and a half -- it's nice to see you post this one. So many of your postings bring back fond memories. Thank you so much for including the Cathedral of the Incarnation-it is heart-warming to know that others appreciate this house of worship that assisted the Stewart's to increase the population in their new planned community located on the Hempstead Plains called Garden City. 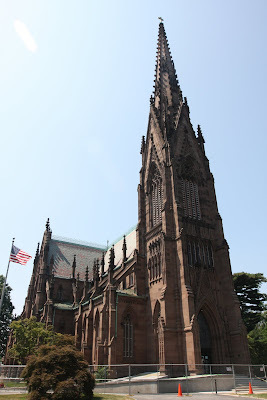 It is wonderful that the Cathedral is associated with "Old Long Island," however I do not see anything written as to why it is associated with the "Gold Coast." Was it a place where the well-to-do attended service? Could you please name a few "Captains of Industry" who did attend. Like Alex, I am aware of the Cathedral. It was built as a memorial for Alexander T. Stewart, founder of the department store and Long Island Railroad (today's Hempstead Line), by his wife Cornelia Stewart. She also had two schools built while the Cathedral of the Incarnation was under construction. St. Paul's School, a boys school was also a memorial to A.T. Stewart and The Cathedral School of St. Mary which was a girls' school. I attended the girls school which was located across the street from the Cathedral. The boys school, St. Paul's School was located on Stewart Ave. Both schools opened in the 1870's and remained single-sexed. In the 1970's the upper grades attended classes on each other's campuses and certain clubs were co-ed. Eventually, both Schools merged in the late 1980's, but then were closed in 1991. Despite attempts to reopen the schools, they remained closed. The property upon which the Gothic St. Mary's was located was sold and the 1870's property with wooden floors, high ceilings, several parlours, and dumbwaiters were demolished to make room for four luxury homes. 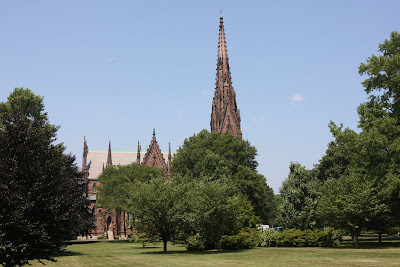 St. Paul's, by the Grace of God, still stands, but is in poor shape as the town and those interested in preserving Garden City history debate its future. Perhaps now with the election of Mr. Donald J. Trump, funding will be found to renovate and preserve St Paul's School, Garden City since some Mr. Trumps siblings attended the School. According to John Ellis Kordes of Garden City News Online (www.gcnews.com/news/2016-04-29/Community/WHATS_UP_GC_.html), Fred, Jr. and Robert Trump attended St. Paul's School and the an athletic field named for Fred Trump, Sr. because he donated to restoring the playing fields. Perhaps you could find out which wealthy or famous Long Islanders also attended those schools in the late 1800's to the 20th century so as to add context to your blog/site. Thank you so much for posting the Cathedral. When one's schools are gone, one clings to the remnants. The Cathedral was part of the Schools' experience. Every year, students got their blessings the first day of School. Then students attended Cathedral Day where all the students in the Long Island Diocese were blessed, Christmas concerts were held there and the year concluded with two graduations. Young men dressed in uniform best marched the aisle in the early afternoon to commence their lives. The young women attired in long white formal gowns carried red rose bouquets to receive their final blessings at commencement in early June.